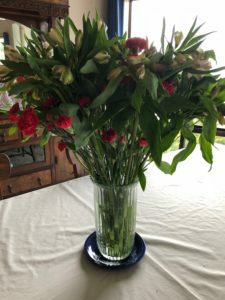 To this day, several of the lessons I learned while under the tutelage of a wise British woman, Irene, and her talented floral-creator daughter, Adele, have contributed to my respect for, love of, and craving for flowers both inside and outside my home. The hospital where Jeff was born, and ultimately died, was just 3 blocks from this shop. When there is a death, there is usually a birth within a 24-hour period. Always start with a good foundation – a clean vase – washed with soap and water, or possibly bleach. Use the food packet – the packets you get contain sugar (nutrients), an acidifier (to maintain the water’s pH level so flowers can soak up the water), and bleach to kill any bacteria. Give the stems a fresh cut since exposure to air seals the stem. Cut the stem at an angle for more surface area to drink up more water. Be sure to remove all leaves that will be in the water because the leaves rot and often are the carrier of diseases. Check the water level daily. Keep the arrangement out of the sun or direct heat to prolong their beauty. Yesterday my husband said how much he appreciated I “beautified” our home with flowers. First, I found that surprising because in 28 years he has never made a statement along those lines. 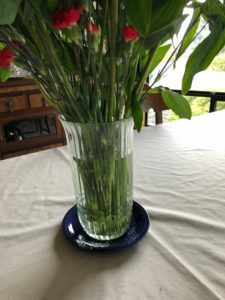 Second, as I was removing the 4-week-old blooms from the dining room table vase, he started asking more questions about the new flowers I had purchased. Why did I use bleach to clean the vase? Why do I remove the bottom leaves? Why do I cut the stem at an angle? 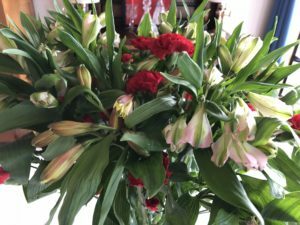 As I was putting these beautiful Alstroemeria buds in the vase, he asked, “Will those buds open?” With a smile I said, “Yes, by tomorrow they will be open.” And because they are buds, they will last 2-4 weeks. With delight in my heart from his awareness of this ritual I do, I was overjoyed I had been able to find one bouquet of RED mini-carnations to add to the arrangement. Since it’s only about a week after Valentine’s Day, finding anything RED is very unusual. This is a way I “Love-On-My-Home” as well as giving myself “Self-Love.” Go get some flowers for your home and your heart! Then, please share it here! 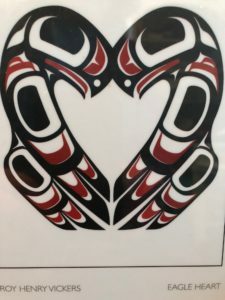 Inspired at Valentine’s Day 2012, this piece by First Nation artist Roy Henry Vickers depicts two Eagles and a heart connection. Some pieces of art really move me. They touch me deep in my soul. This is one such piece. Created by Roy Henry Vickers, a First Nation artist in the Tofino area of Vancouver Island, BC, Canada, it spoke to my heart in April 2016. Little did I know the impact it would have on my life. I purchased this piece as a symbol of the deep love I share with my Soul Mate, Hilory. We have gone through many health challenges together, some were supposed to end in death. We celebrate 28 years together this year. The surprising thing is a move we did last year to the Pacific Northwest. In 2016 we still planned to live in California all our lives. Yet, shortly thereafter, life circumstances changed. We decided to move. 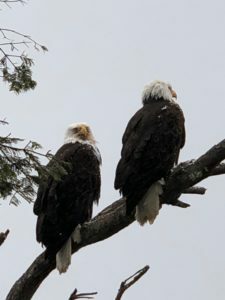 Now at the waters edge of Dungeness Bay across the Strait of Juan de Fuca from Vancouver Island, Canada, and Victoria Harbour, we have these incredible Bald Eagles as our neighbors. Today, Valentine’s Day 2019, two Bald Eagles landed in a tree outside our bedroom window. Perched together, they posed for an hour for me while I talked to them. Images are powerful. They connect deep to your soul, moving you towards their reality. What are the images surrounding you? What are they telling you? Are they really what you want? Now is a good time to analyze each piece of art. Make sure they are setting the intentions to manifest your heart’s desire. Set Intentions for Your Life on the Chinese New Year! What do you want (or don’t want) this year? In the Asian culture it is believed whatever you do on New Year’s Day will be what you do ALL YEAR LONG! Give that a thought – a serious thought! 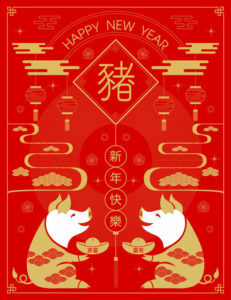 To have a fabulous year be conscious of what you do all day on Chinese New Year, February 5, 2019. This is a time to set your intentions for the year you want! This is a time to focus on attracting luck and good fortune for the rest of the year. Do you really want to be cleaning your house or paying bills? Where does your work or career fit into your desired lifestyle? Maybe today you don’t work 16 hours. Is today the day you go to the gym instead of sitting watching TV. These are a few traditions followed in the Asian culture. This is a day to pray to your God or Higher Power – giving thanks for the many blessings bestowed upon you. Put away all knives and scissors, so you don’t “cut off” the Good Luck coming your way. Start the New Year with new clothing to look your best. Budget conscious? How about new socks, tie or belt. Put money in a savings account to symbolize “building your wealth” this year. Having plenty of food in the house since it represents prosperity for the coming year. Red is the preferred color for clothing and decorations. Use liberally if possible. Rest, be gentle on the first day of Chinese New Year. Have oranges or tangerines to eat and give as gifts. They represent abundance, good health and joy because of the abundant juice that squirts out everywhere! Have lots of flowers. 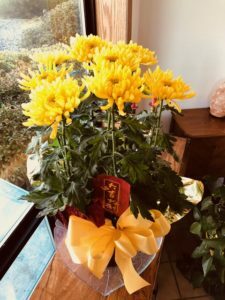 Yellow chrysanthemums mean wealth or gold. Orchids are for fertility and abundance. Peach and plum blossoms are for love and health. When visiting people, bring gifts of alcohol, flowers, fruit, sweets or tea. For children, bring red envelopes with money or sweets in them. I wish you the Very Best Year with Many Dreams Come True!